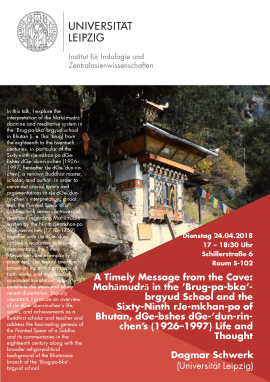 Our Senior Research Fellow Dagmar Schwerk will give a public lecture titled "A Timely Message from the Cave: Mahāmudrā in the ’Brug-pa-bka’-brgyud School and the Sixty-Ninth rJe-mkhan-po of Bhutan, dGe-bshesdGe-’dun-rin-chen’s (1926–1997) Life and Thought" on 24 April 2018, 5 p.m. at Schillerstr. 6, room S-02. 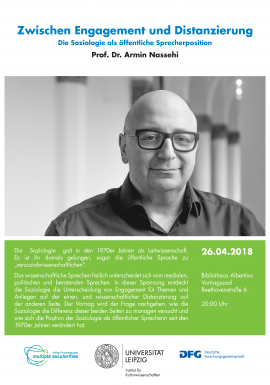 On 26 April 2018, 8 p.m., Armin Nassehi will give a public lecture titled Zwischen Engagement und Distanzierung. Die Soziologie als öffentliche Sprecherposition (Between Involvement and Distancing. Sociology as Public Speaker). He will trace the development of (German) Sociology in this area of tension since the 1970s. The lecture will be held in German at Bibliotheca Albertina, Vortragssaal. On 23 April, 6 p.m., Elena Valussi will give a pubilc lecture on Gender and Relgion in the Republican Period at the Konfuzius-Institut Leipzig, Otto-Schill-Str. 1. She will address the question of gender and religion in the Republican period (1912-1949) in China through the analysis of printed journals and newspapers. While scholars have identified and described a dichotomy between religion and superstition emerging in the early twentieth century, she tries to understand the place of women (and gender) in this description, the strong association of women with superstitious behaviors, and at the same time the centrality of gender in the quest for the modernization of religious traditions. 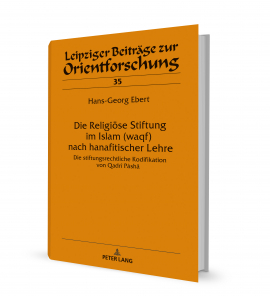 Hans-Georg Ebert has recently published the monograph Die Religiöse Stiftung im Islam (waqf) nach hanafitischer Lehre. Die stiftungsrechtliche Kodifikation von Qadrî Pâshâ. He provides a commented, critical translation into German of Muhammad Qadrî Pâshâ's (d. 1886) compilation of waqf-law, which can be seen as a legal source for the national laws of Islamic countries. Hence, standards and methods can be derived from it to reform the religious endowments to strengthen their social responsibility. The text was printed in 1894 in Bûlâq (Cairo) following an Arabic manuscript (646 articles).